As consumers of energy, there are many things that each of us can do to help reduce the amount of energy that we use. Saving energy not only helps us save money, but has a positive impact on the environment. Below are tips from the U.S. Department of Energy on saving money on heating water in your home. For more money saving tips, download the Energy Savers Booklet. According to the U.S. Department of Energy, water heating is the third largest energy expense in your home. It typically accounts for about 12% of your utility bill. There are four ways to cut your water heating bills: use less hot water, turn down the thermostat on your water heater, insulate your water heater, or buy a new, more efficient model. Lower the thermostat on your water heater; water heaters sometimes come from the factory with high temperature settings, but a setting of 120°F provides comfortable hot water for most uses. 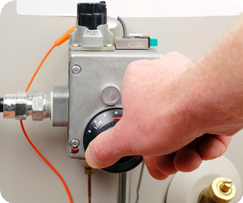 Insulate your electric hot-water storage tank, but be careful not to cover the thermostat. Follow the manufacturer’s recommendations. For more energy saving tips at home, download the Energy Savers Booklet by clicking on the booklet icon above. 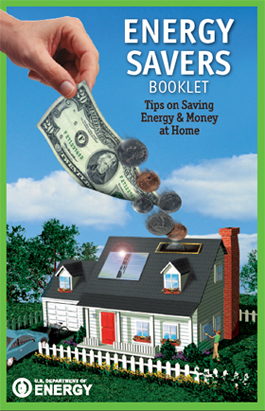 The U.S. Department of Energy offers the Energy Savers Booklet with tips on saving energy and money at home. Click the image above or click here to download the booklet.